Two years after the powerful earthquake and resulting tsunami  off the northeastern coast of Japan triggered a meltdown at the Fukushima nuclear power plant , the Japanese people are becoming increasingly frustrated with the government's reluctance to come clean on the risks associated with nuclear power. A Japanese citizen advocacy group called Let’s Decide Together  organized a large protest on March 10, 2013  [ja] to call for a national referendum on the future of nuclear power in Japan, the latest of many citizen-led efforts to shape the country's energy policy away from nuclear power since the Fukushima disaster, the largest nuclear disaster since Chernobyl . In the wake of the tsunami, critics around the world blasted the Japanese government for withholding information about the meltdown  from the public, delaying local evacuations and exposing some people unnecessarily to high levels of radiation. The World Health Organization has concluded  that those in the most contaminated areas around the Fukushima plant have elevated risks of contracting cancer, from a 7 percent increased risk of leukemia for males exposed to the radiation as infants, to a 6 percent increased risk of breast cancer for females exposed as infants. Though public pressure after the accident led to the shutdown of all but two of Japan's 50 nuclear reactors, Japanese Prime Minister Shinzo Abe recently announced  that plants that pass the country's new and stricter safety guidelines could be brought back online within the year. But the government's emphasis on safety has not calmed Fukushima residents and activists around the country who demand more information about the dangers of nuclear power, no matter how bad the news may be. The Fukushima Ministerial Conference on Nuclear Safety , co-hosted by the Japanese government and the International Atomic Energy Agency (IAEA ) from December 15-17, 2012 in the city of Koriyama in Fukushima Prefecture, not far from the nuclear power plant, exposed the growing gap between the government and its people on the matter of nuclear energy. The conference, in which 117 countries and 13 international organizations participated, was held to discuss and strengthen nuclear safety  as well as learn from the Fukushima disaster. We believe that by holding a meeting in Fukushima Prefecture only one year and 9 months after the accident, we were able to send a strong message about the importance of strengthening nuclear safety. In addition, our high level discussions about efforts taken by the international community were held just one year after the IAEA Action Plan on Nuclear Safety  was developed. This will ensure that we further strengthen the international safety. At the same time, many anti-nuclear organizations organized their own conferences. The Nuclear Free Now Organizing Committee  hosted its Global Conference for a Nuclear Power Free World 2  in Hibiya, Tokyo on December 15 and 16, 2012 and the Metropolitan Coalition Against Nukes  organized a demonstration calling for the end of nuclear energy that departed from Hibiya park. More than 5,500 people participated in the two days of events in Tokyo. Also, the Fukushima Action Project , organized by a committee of citizens from Fukushima Prefecture in collaboration with the Nuclear Free Now Organizing Committee, coordinated various action from December 14-16, 2012 including a symposium by the Mayors for a Nuclear Power Free Japan network  to coincide with the government conference. On the first day of the government conference, about 200 citizens gathered in front of the conference venue in Fukushima to submit a formal request to the IAEA. 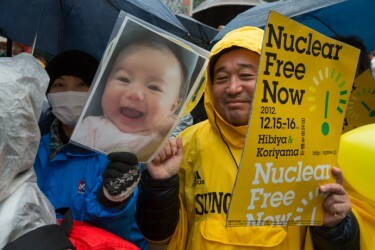 The request called on the IAEA to disclose the data from a health survey of children, ensure accountability, and encourage the Japanese government to decommission all nuclear power plants immediately. We have learned that the International Atomic Energy Agency (IAEA) will establish two research centers in Fukushima Prefecture, as part of the Prefecture's ”Environmental Creation Center.” Based on the nature of the IAEA, we perceive it to be a global nuclear power promotion industry, emphasizing the peaceful use of nuclear and understating its risks. It is quite difficult to imagine and understand what such an institution is planning to do coming here to Fukushima. Many of us affected by the nuclear power plant disaster are questioning whether these research centres will have any benefit for those affected, and are concerned about the real intention. All that the government has done is to conduct a “safety campaign,” by telling people that “there are no immediate health risks”, or “it is alright to be exposed to 100μSv of radiation per year.” The residents of Fukushima are forced into a difficult decision between the fear of radiation, which cannot be seen or smelled, and the authorities’ “safety campaign,” which is causing great distress and fraction between families, friends and neighbors. IAEA is not in a position to say to the member states that you should adopt or continue or stop the operation of the nuclear power plants. However, if the member states consider the introduction of nuclear power or make the decision to continue operating nuclear power plants, IAEA plays a role in examining whether the nuclear power plants are sufficiently safe and meet international safety standards. IAEA will support the operation of the nuclear power plants to be sustainable and safe with sufficient consideration to neighboring countries. 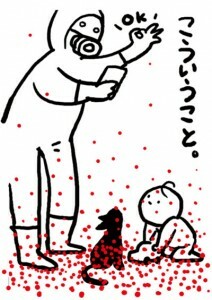 The two “Red Dot” radiation illustrations in this post were drawn by artist Misato Yugi and have become widely known in post-Fukushima Japan. The illustrations try to show how dramatic the situation would be if radioactivity were visible. 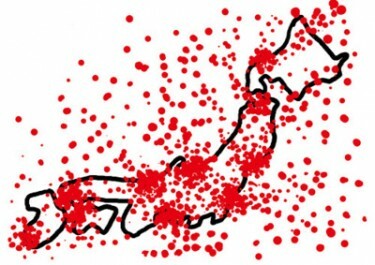 But without red dots marking radioactivity in real life, the Japanese people are left to demand the truth about the dangers from the government and other agencies. Ourplanet-TV , a non-profit media station, captured a member of the Fukushima Women's Network against Nuclear Power Plants  [ja] doing just that on December 15 near the government conference venue, asking for the facts surrounding nuclear power from IAEA spokeswoman Jill Tudor. We want IAEA to remember, Fukushima prefecture has already decided to renounce nuclear power  [ja]. There is one other thing. Please tell us the truth about Chernobyl, Please speak the truth of the health effects after Chernobyl. Lastly, in the three-day conference starting from today, please talk about the dangers of nuclear power, not the promotion of the safety of nuclear power plants. And please switch the agenda to eliminate the nuclear power plants in the world. Please don’t decide on anything about Fukushima without the Fukushima people, us! Each and every one of us should realize that only you can protect yourselves and your families, so keep collecting information on your own. If you feel butterflies in your stomach, I want you to continue taking actions on what you can do, no matter how small they are. The thumbnail image used in this post is taken and shared by Masahiko Murata .